The story board from an article I and Mark Aspery did for the Hammer's Blow. One day I'll do a more detailed posting. In 2014 I journeyed to the Northwest School of Wooden Boat Building, for what was to be a year of learning to build boats. Family events only allowed me to attend the first semester :--( Anyway, there was a long list of needed tools. I looked at the list and though "Buy these?, I can make them" Didn't get many done before it was time to start school, but some of the chisels I did. 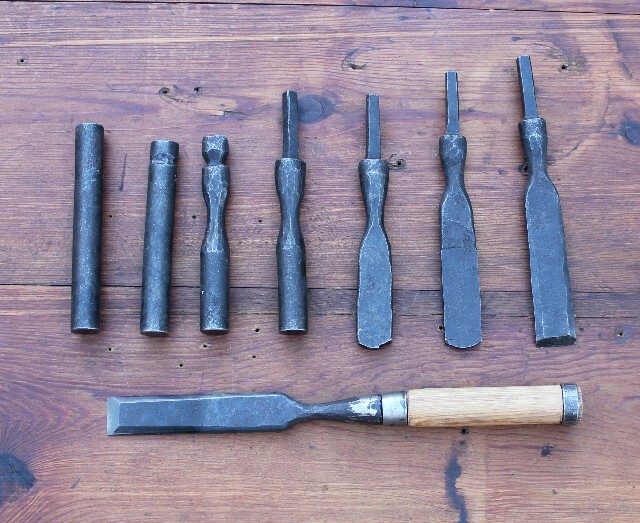 From that, came the idea of doing the article on chisel forging. Missing in the photo is the small bit of high carbon steel that was forge welded on during step 6. That looks like a very functional wood chisel.very nice . I have bought many in my days and most end up as hold scrapers or trash by the end of there life.nails are rough on the ends lol. So did you just forge weld a high carbon piece in the end ? Nice. A big 2" framing slick is on my eventual "to do" list. One of these days I'd love to take a timber framing class and be able to make my own chisels. So did you just forge weld a high carbon piece in the end ?